A cat litter mat is ​designed to help contain the spread of litter when the cat leaves the box. The mat is placed in front of or just underneath the cat litter box. In a hurry? Head straight to Recommendations (link ​in the Contents) for a ​quick summary of what we currently recommend. ​Do I Really Need To Get A Cat Litter Mat? ​The purpose of the mat is to stop litter being tracked from kitty's paws throughout the house, as he leaves the litter box. ​If you have a litter box indoors, a mat is pretty well essential and will save you a lot of time cleaning excess litter from around the box. Is the mat easy to pick up? An important point because this will be done frequently. The mat should have a soft surface and not be rough on paws. Cats are more likely to walk on the mat if using a covered tray and that is because there is only one way out of the box and the cat will have to walk over the mat. A large mat is good if you have the space but maybe not so good if you need to carry it a fair distance to wash. Check the weight of the mat to ensure that is is suitable for you. The mat needs to be easy to wash. Some mats can have a strong smell although this usually dissipates with time but something to be aware of is if this could be a potential issue for the cat and the household. Phthalates, a family of industrial chemicals used to soften PVC plastic and as solvents in cosmetics and other consumer products, can damage the liver, kidneys, lungs, and reproductive system. This cat litter mat is BPA and Phthalate free and has no strong chemical smell. I can’t tolerate any strong chemical odors so this is always a consideration in our house, for the cat but also for me. This very short video clearly shows the features of the mat. To loosen the litter from the mat just give it a shake and return litter to the box or shake it outside in the garden. The mat can be vacuumed and washed like other mats although it is probably not a good idea to machine wash. The recommendation is to hose the mat or wash in a laundry tub or even in the shower to loosen any trapped litter. Use a pet friendly soap to clean and refresh. The mat has a non slip bottom and a double layer of sealant to make sure floor covering underneath the mat is protected from any urine. It is​ safe to use on carpet. It has a money back guarantee if you are not 100% satisfied. 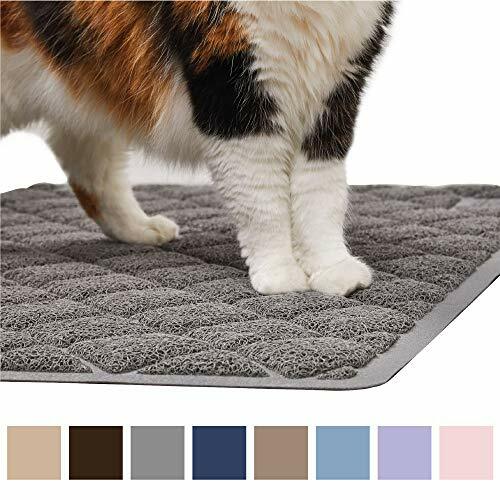 This mat is super thick and soft for kitty to walk on and is made from a tough durable PVC fabric. It is very soft with a low loop pile, so claws will not get stuck in the loops. It is easy to shake the litter from the mat and if the litter is being stubborn a good tap on the back of the mat will take care of it. The mat can be vacuumed and washed or rinsed with soap and water when necessary to keep it clean and fresh. It has a rubber backing so won’t slide and can be used on carpet. There are five different colors - beige, black, brown, lavender, light gray, ocean blue. This is a soft mat that traps litter well. It features deep grooves and superior mesh to collect and capture litter that is not only stuck to paws but may h​ave been kicked out of the box. This mat is made from PVC plastic. It is Phthalates and BPA free with a non slip backing. Some people have mentioned that the mat has a strong plastic smell whereas others have not notice any smell. If your mat does have a strong smell. a suggestion would be to leave it outside or in a place where it will get fresh air for approximately 24 hours. This mat is not totally leak proof although it will withstand a small amount of liquid. If you think the cat may pee on the mat it would be advisable to put the puppy training liners ​​​​​​underneath to protect the floor surface. A tiled floor, slate or concrete is easier to clean leakages. It is easy to clean, shake it out, vacuum or hose and wash with soap and water and let dry. ​​Shake the litter back into the litter tray or outside. 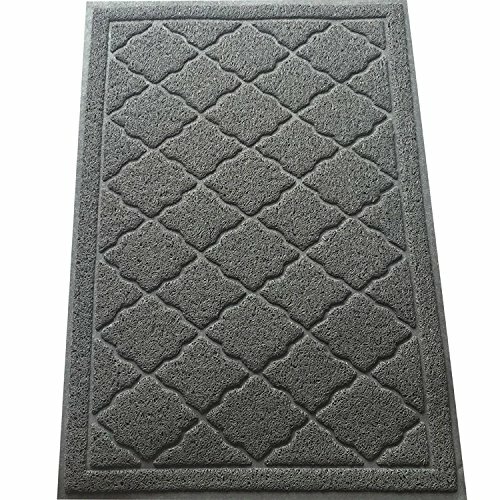 This mat ​​has a great color and size and shape selection including rectangular, half circle and corner. This mat is made from soft EVA rubber. This size is a medium square measuring 23' x 21". Other sizes measure 30" x 23" and 36"x 25". There is also a mat shaped like a kitty head ( it's kinda cute). It is suitable for use with different sorts of litter including clumping litter. The mat is surprisingly light. It can be rinsed in the laundry tub if the cat pees on it or hosed depending on what is suitable for your situation. Don't put the mat in the washing machine. For normal cleaning fold the mat in half and take it outside to shake or empty into the garbage or put back in the box. 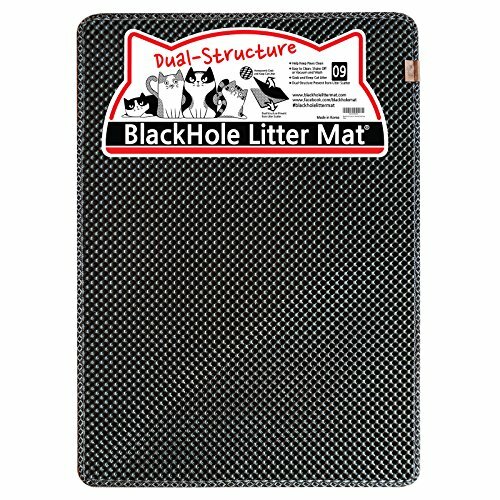 The litter is easy to dump from the mat, so there is no excessive shaking required. 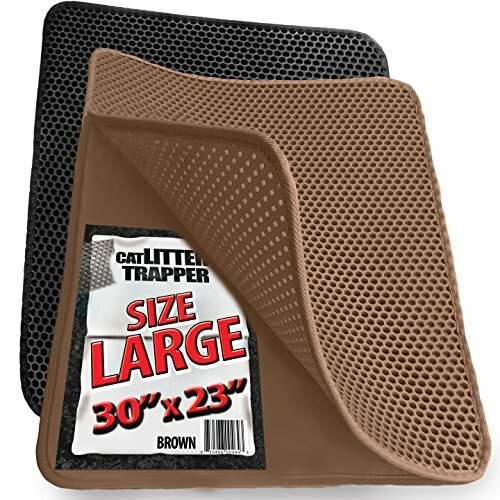 iPrimio Large Cat Litter Trapper Mat With Exclusive Urine/Waterproof Layer. It comes in two colors, brown or dark gray. It also comes in two sizes so make sure you measure before buying. There is also a Jumbo size, measuring 32"x 30". The unused cat litter can just be put right back into the litter box so you are not sweeping up or vacuuming unused cat litter. It is made from EVA foam and does not appear to have a smell. It has a smooth surface comfortable for humans and cats to walk across. iPrimio recommend using puppy training pads underneath the mat because they do an excellent job soaking up any excess urine. 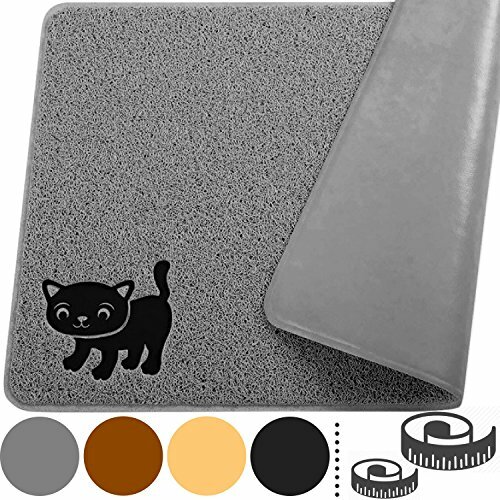 Recently we have added the Smiling Paws Cat Litter Mat ​to this review and now highly recommend this product for its all round durability and because it worked in all situations and ​has the added bonus of the double sealant to protect the floor underneath from moisture.​ It can also be cut to size. Watch the very short video in the review above to see this mat. ​The Easyology Cat Litter Mat is​ a very good reliable and hugely popular product at a lower price point. It has a rubber backing, low loop pile and can be used on carpet. A cat litter mat is not just a good idea but really essential. I'm all for saving time cleaning up. I couldn't imagine not having a doormat at the front of my home so this just makes perfect sense. ​Keeping kitty litter under control is an ongoing job. Take your finger off the pulse and litter could literally take over. Okay that is a bit extreme however if litter control is your thing you will find more helpful information in these articles. Which vacuum works the best for cat litter? Read the two awesome hints in this article - simple but very good ideas. 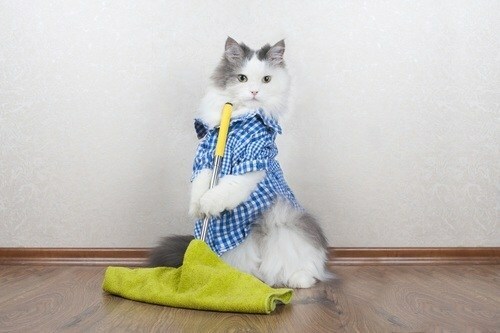 ​Have you considered a self cleaning litter box? Does it sound too complicated or too expensive? This article sheds some light on both of these issues. Previous Post A Glossary Of The Best Flea Treatments For Cats Next Post What Is The Best Litter Scoop For Cat Litter Boxes?